Baby's cotton quilt pieced in Mixed T pattern. Top is composed of 63 small square blocks in all-over set without sashing. 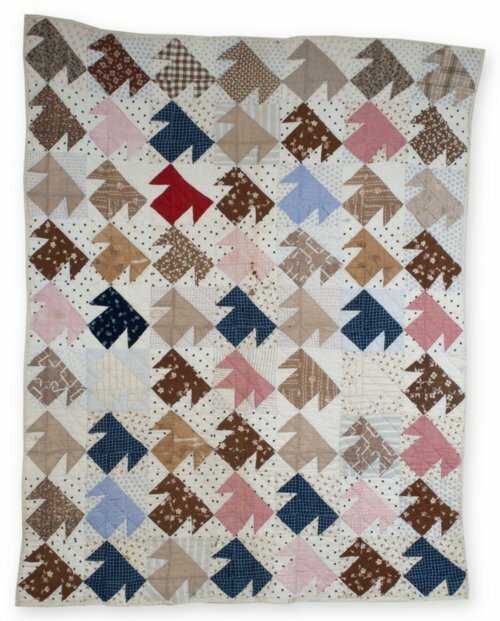 Each block features a large block "T" pieced of brown, blue, or pink print fabrics on a light shirting print background. Cotton batting visible through holes in top. White cotton backing turned up and over edges to form binding. Hand-pieced with machine-sewn binding Hand-quilted in diagonal lines overall. Eva M. Spicer of Ford County, Kansas, made this quilt for her daughter Augusta Spicer Hamar, born in 1889.